My new horse, Freedom, used to get incredibly nervous when training. He’d prance around and break out into an anxious sweat, even if we were just standing in the middle of the arena! 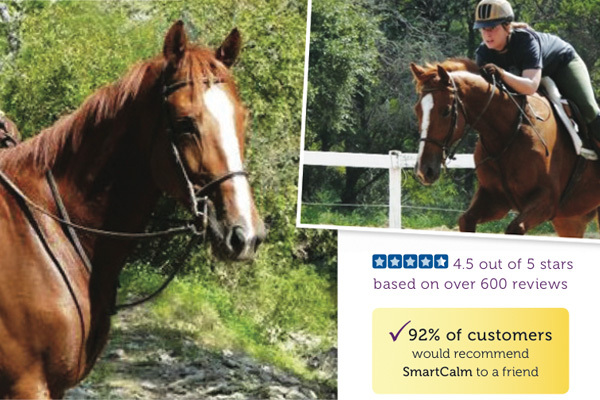 I have tried other calming supplements on other horses without much success, but decided to try SmartCalm Ultra based on the reviews and ingredients. After a short time, I saw a drastic improvement. SmartCalm Ultra seemed to ease his anxiety, and he was able to focus and actually use his brain. I now ride in lessons with many other horses and he goes around with his ears pricked forward. Thank you SmartPak! I as well am now seeing results with this product. It took several weeks, but now my 3 yr old TB gelding , while still having plenty of energy, is much more focused and no longer breaks out in those nervous sweats. He is super cooperative now, but not sluggish, with still good forward motion.